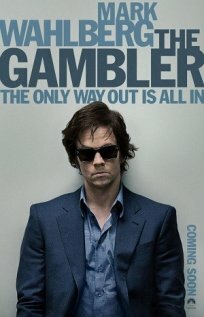 THE GAMBLER (2014) starring Mark Wahlberg, Jessica Lange, and John Goodman is a remake of James Toback’s film THE GAMBLER (1974) starring James Caan – modeled after Fyodor Dostoevsky’s 1866 novella also titled THE GAMBLER, originally penned to pay off Dostoevsky’s real life gambling debts. With such a rich history behind this highly anticipated movie, I was disappointed to witness such a disjointed storyline. This is a movie that’ll leave audiences scratching their head and wondering exactly what was the point of Wahlberg’s journey? English literature professor Jim Bennett has a pension for high-stakes gambling in the underground world of no-limit casinos. When he racks up debts to multiple loan sharks totalling over a quarter of a million dollars, Bennett finds himself scrambling to pay off his makers. With his life on the line, the professor by day and gambler by night desperately attempts to raise the cash before the seven day deadline – aware that his life has now been offered as the ultimate collateral. Having dropped 61lbs just to play the gambler, Wahlberg reported this was the hardest role he’d ever prepared for and would never drop that kind of weight for a part again. Deeper than the character’s esthetics, THE GAMBLER leaves us asking why? Why is our main character’s desperation to risk everything such a powerfully controlling facet of his personality? Why is this highly educated, silver-spooned individual on such a destructive path? This movie leaves us shaking our heads and repeatedly asking why. John Goodman as the saggy and wizened loan shark, and Jessica Lange as the pinched and pulled mother figure almost manage to steal the show. Although their roles are definitely supporting, their outstanding performances still overshadow Wahlberg’s muddled character. Directed by Rupert Wayatt, 111 Minutes, Rated-R, Mystery, Drama, Thriller, ** 2 stars out of 5.